Very observant… I have a blue car so mine would have stood out. hmmm. I personally favor grey cars (they don’t show the dirt as much) but my husband likes red and blue. I am surprised that Thai drivers go for the ultra conservative colors. I would have thought that there would be lots of vibrant colors in the parking lot! My husband thinks I’m nuts when I yammer on about bland cars. White is the most popular color? Boring. I see a lime green Mustang around here once in a while and it sparkles amid the endless stream of black or white SUVs. There is a rumor going around that when a car blends in the police are not anxious to notice it speeding. Well, mine is bright red and no ticket yet. It’s the same in Korea- but always with windows tinted to almost black. My car would blend in there, i plead quilty here. Hehe. I used to drive a red car, but got ticketed. LoL. same here in jakarta. mostly silver, grey, black and white. In Miami we are different, we got green and pink cars running around. I am one of the metallic silver I love my car though. Blending in is what I aim for. This got me wondering whether that’s a cultural thing in Asia? I remember that cars back home are more colorful. But a part of me thinks that in recent years there is also a tendency to go more monochromatic.I remember bright green CV2s driving around in my youth. 😮 I guess I am old. ..
@slmret – How did Henry Ford put it? “Customers can have any color car they want, so long as it is black.”@beowulf222 – Most likely, many of those cars belong to hi-society folks who have drivers. Those type of cars are almost always a very neutral color. @awoolham – Oh, is that you? (waves)@catstemplar2 – @murisopsis – Interestingly, our taxis here are very colorful – red, blue, green, yellow, pink, etc. It is just the private cars that are boring. 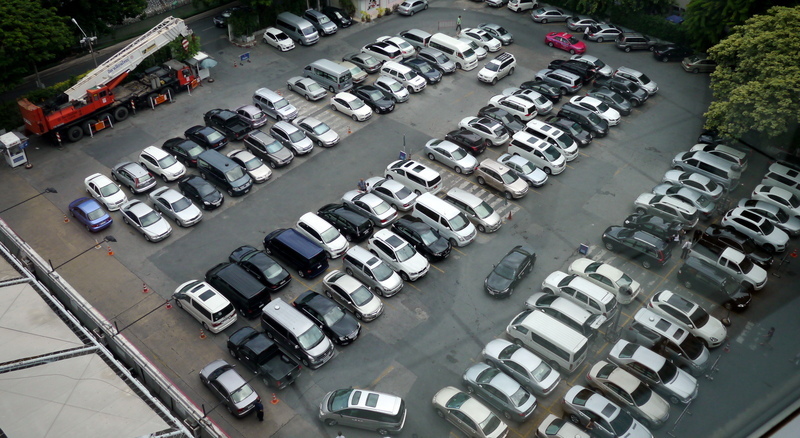 @rudyhou – Maybe ASEAN car factories have only four colors of paint? @stevew918 – Did you really? Speeding? @secade – We get some folks here who have windows that are tinted way past the point of legality. @Fatcat723 – I could understand how such a belief would gain credence. No doubt, though, that you are a safe and conscientious driver. @whyzat – Something in bold blue for me, please!+@mike august – Not the Toyota Pious (ala the South Park epidsode)? @ElusiveWords – You’re a stand-out guy, Matt. mine is an irridiscent silver suv. it will probably blend in there. i like my car. M has a white car. i used to like black cars, probably from days of yore, but i see very few that are black though. So true, sea of metal! This is a great shot. I enjoy coming here to your site and would like to sub to you if you do not mind. My car was a gift so I won’t complain about the bland color. When I buy my first car, it will be purple…even if I have to pay a ton for a custom job.